This hotel is located within a 5-minute walk of the walled city of Old Quebec. The hotel features a heated outdoor pool and offers sight-seeing tours of the area. Hilton Quebec rooms include a flat-screen TV and MP3 docking station. Rooms are equipped with a coffee maker and cable TV. 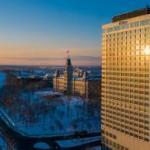 The Quebec Hilton offers views of the St. Lawrence River and the Laurentain Mountains. The hotel provides guests a business center and a gym. Guests at the Hilton can dine at Allegro Restaurant and Bar which features international cuisine and theme buffets. Hilton Quebec is one mile from the Musee National des Beaux-Arts du Quebec (National Museum of Fine Arts of Quebec). The hotel is within a 5-minute walk of the Quebec Parliament buildings..
We plan to add more related stuff like: pet friendly hotels in Quebec, Quebec dog friendly hotels in Quebec, dog parks in Quebec, pet stores in Quebec, QC, and pet spas in Quebec. Keep checking for more!